Please be advised that JCP&L's will be performing planned vegetation maintenance activities for the months of January, February, March and April 2019 will be in Manalapan Township by Davey Tree Service. The Manalapan Arts Council and Mayor Susan Cohen are pleased to announce the holding of the 11th annual Manalapan Township photo contest. The 2019 theme is "A Moment in the Life of Manalapan". The Contest will be looking for pictures of any scene, object, event, people or activity that occurs in Manalapan that inspires an appreciation of residing in the town. Each year’s contest has been very successful as over 400 photos have been submitted in the past 10 years. Linda Steele, Contest Co-Chair, explains the contest and theme. “This year the Photo Contest Committee deliberately chose a very broad theme. Over the years we have selected themes that celebrated life here in Manalapan and identified specific topics to be photographed – such as animals or the Jersey Shore. Often, we have been rewarded in each contest with very artistic presentations. This year, the theme allows for a lot of imagination – the subject can be a person, place, pet, food, activity, etc. – the proverbial ‘sky is the limit’. We encourage all Manalapan residents to consider submitting a photo.” Teresa Erlitz, fellow Contest Co-Chair, went on to explain what they are looking for, “As usual, we want to make it as difficult as possible on our Judges! The judges will be looking for photographic quality and will be incorporating titles and artistic flair in their evaluations. The Judges will be open to all the details in the photograph. 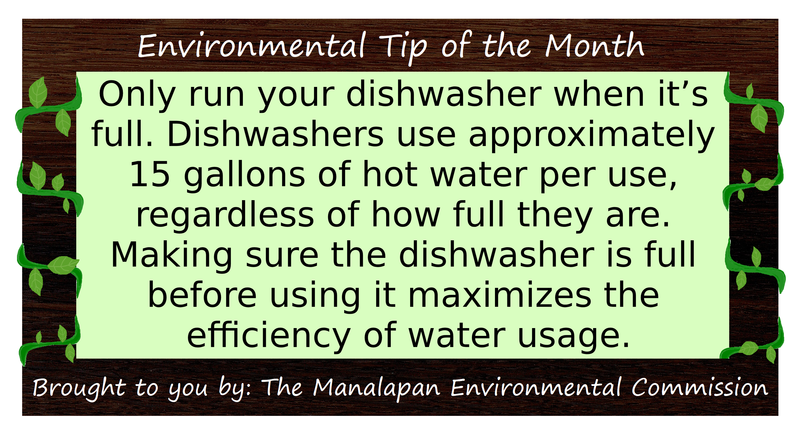 We encourage all Manalapan residents to consider submitting a photo and a short caption that describes their photo." "First of all I want to thank the Manalapan Arts Council for again organizing and selecting the theme for our Annual Photo Contest. I especially want to recognize the stewardship of our co-chairs - Linda Steele and Teresa Erlitz – who are stepping into new roles.” said Mayor Susan Cohen. Mayor Cohen added, “I have looked at the photos from previous contests when they have been on display in the courtroom and I am always so impressed with artistic talents of the residents of our town, and how they have captured the essence of each theme in their photos. I am really looking forward to a new set of wonderful photos that showcase our beautiful town!" People's Choice – the photo that receives most votes from the Manalapan Day (June 8th) display will also win a prize of $100. As mentioned, all photos will be on display at the Manalapan Day community event on June 8, 2019 where the special “Peoples Choice” award will be given to the photo that garners the most votes that day from the visiting and judging public. Photographs must be received by 4:30 p.m. on May 24, 2019. 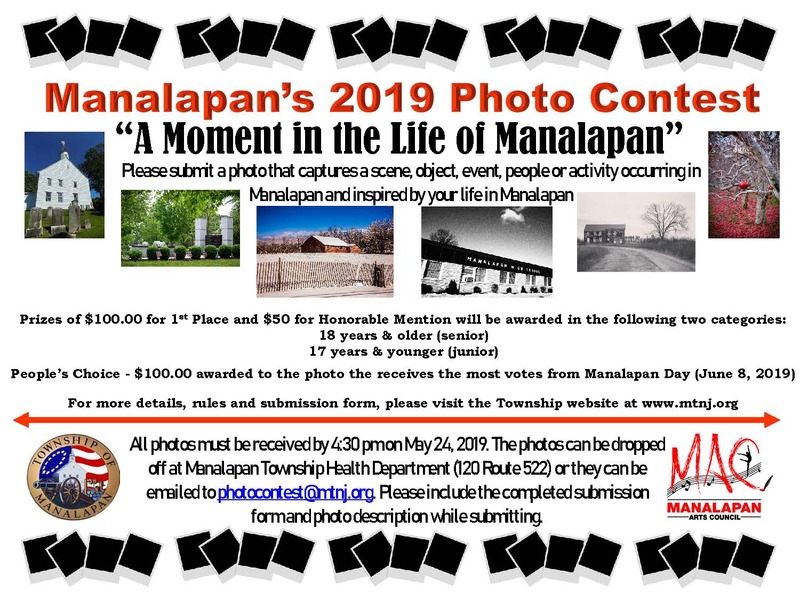 Photographs can be submitted by email to photocontest@mtnj.org (file must be less than 5mb) or dropped off at the Manalapan Township Health Department (photographic prints must not be larger than 5” x 7”). The full set of rules and the submission form are available online at the Township website – www.mtnj.org – or at the Manalapan Township Health Department. Please remember a submission form must accompany the photograph. Forms are also available on the Township web site or at the Manalapan Township Health Department. For more information please contact the Health Department at 732-446-8345. 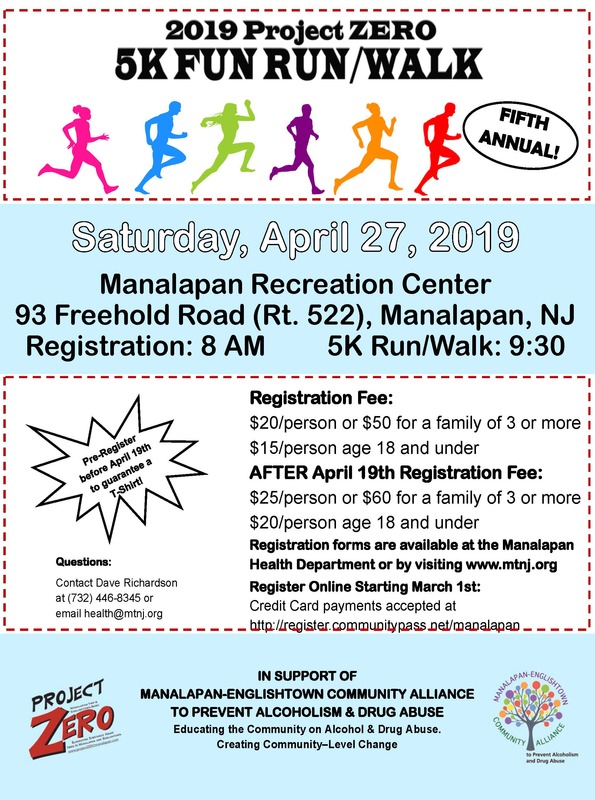 The Manalapan-Englishtown Community Alliance will be conducting its 5th Annual Project ZERO 5K fun run/walk on Saturday, April 27, 2019. This event will raise awareness and money for the Alliance’s efforts to educate the community on the dangers and consequences of drug abuse and alcoholism. The race will be held at the Manalapan Recreation Center on Route 522 (Freehold Road). The start and finish will be at the foot of the 5k/3.1 mile loop behind the basketball courts and tennis court area. Registration starts at 8:00 a.m. and the race will begin at 9:30 a.m., rain or shine. The registration fee is $20.00 for participants over age 18 or $50.00 for families of 3 or more until April 19th. Youth age 18 and under can register for $15.00. After April 19th the fee increases to $25.00 per person or $60.00 for families and $20.00 for youth age 18 and under. There are team rates as well – please call the Health Department for more information. All race participants that register prior to April 19th are guaranteed a race t-shirt. The event is designed to be fun but recognition medals will be awarded to the top 3 finishers in each of 4 categories – men, women, girls age 14 and under and boys age 14 and under. With support of the local running group - Gone Running - all runners will be timed. To register please contact the Manalapan Health Department at 732-446-8345 or projectZERO@mtnj.org or visit the Manalapan Township website – www.mtnj.org – and download a registration form. All fees must be paid with a check or cash or online at https://register.communitypass.net/manalapan. The mission of the Manalapan-Englishtown Community Alliance to Prevent Alcoholism and Drug Abuse is to meet the need for comprehensive alcohol and drug abuse awareness, planning and programming to create community-level change in Manalapan Township and Englishtown Borough. For more information on the Alliance or to become part of the Alliance please contact the Manalapan Health Department at 732-446-8345 or projectZERO@mtnj.org. Project ZERO is a collaborative effort of the Manalapan-Englishtown Community Alliance - engaging Manalapan and Englishtown individuals, groups and businesses, who when working together, expect to make a serious difference and start to eliminate drug and alcohol abuse here. In 1987 the National Council on Alcoholism and Drug Dependence, Inc (NCADD) helped establish April as Alcohol Awareness Month to help reduce the stigma often associated with alcoholism. The Awareness Month recognition offers communities the focused opportunity to increase awareness and understanding of alcoholism, its causes, effective treatment and recovery. It also gives the Manalapan-Englishtown community the opportunity to focus a month long intensive message project on issues related to the use of drugs and alcohol through our Project ZERO campaign. Suez has scheduled spring fire hydrant and water main cleaning beginning on or about Monday, March 25, 2019 which will last through about Friday, April 26, 2019 weather permitting. The flushing will occur during the work week, and crews will not flush on Friday, April 19. The spring leaf collection will take place during the weeks of April 8th and May 6th. Please place bagged leaves at the curb, not in the street, on the first day (Monday) of each scheduled collection to insure you will not miss either collection. NO leaves will be collected that are not contained in these biodegradable bags. Bagged leaves containing twigs, grass, brush, weeds or other debris will not be collected. If you did not have bagged leaves at the curb in time for the collection, you may bring them to the Public Works yard at 207 Route 522. The 2019 Municipal Budget was introduced at the Township Committee on March 27th. The Public Hearing is scheduled for April 24, 2019. The Manalapan Arts Council (MAC) will present MANALAPAN DAY on Saturday, June 8, 2019 from 3PM-10pm at the Manalapan Recreation Center. This is the BIGGEST and BEST event of the year. Our annual kick off to the summer celebration will bring together thousands of residents from Manalapan and its surrounding towns for the event of the season, attracting attendees of every age! This year we are excited to present the renowned group Under the Streetlamp to take the main stage at 8pm. The former members of the Broadway smash hit "Jersey Boys" have played sold-out shows across the nation, performing classic hits of the '50's, '60's & '70's, breathing new life into the famous songs of Motown, Doo-Wop, and Rock n' Roll. To conclude the evening, we have planned a fireworks extravaganza to light up the skies of Manalapan for miles. 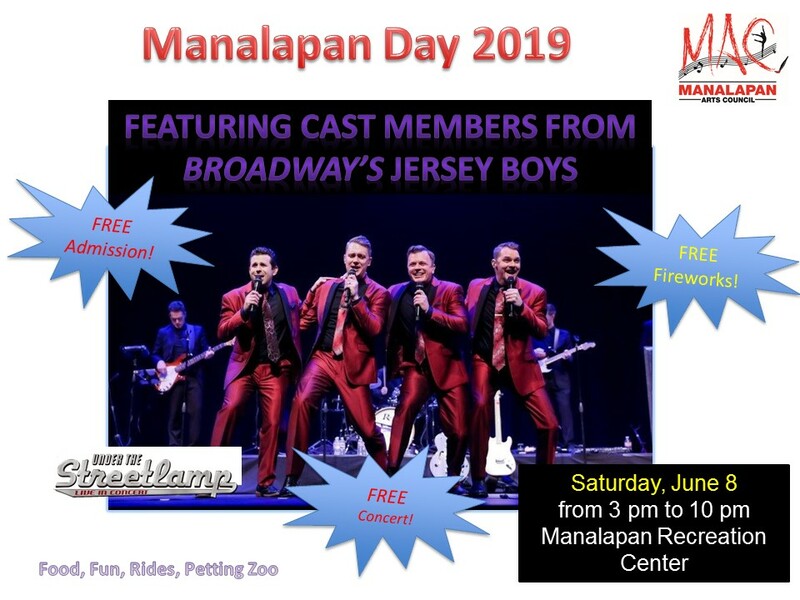 Fun and food make Manalapan Day an all-day event, including games, rides, ponies, petting zoo, exhibits, local performance groups, great food vendors, and non-stop entertainment! Please join us as a vendor or a sponsor for this wonderful Manalapan Township community event! Please see the attached Sponsor Letter and Sponsor Application. Please see the attached Vendor Application and Rules and Regulations. Email info@mtnj.org with any questions you may have! Unfortunately, if it is not on this list it can’t be accepted. Items that definitely cannot be accepted include books, computers, printers, tires, batteries, mattresses, TVs, VHS tapes, CDs, DVDs, car seats, strollers, highchairs, playpens or toys. 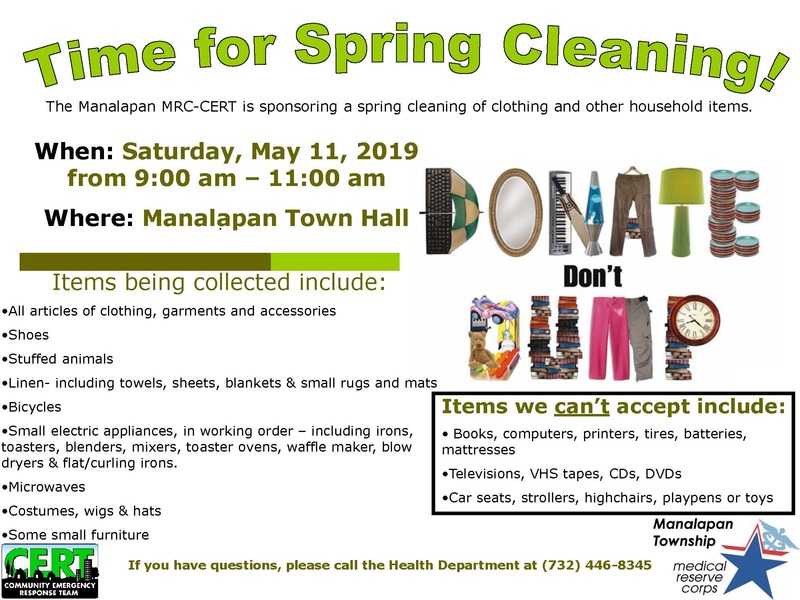 So, start gathering your unused, out of date, non-working items that you have from this list, store them safely and then bring them to Manalapan Town Hall on Saturday, May 11th, 2019 from 9:00 am-11:00 am. The Manalapan MRC-CERT is a volunteer based organization that supports the Township’s emergency management and response agencies. For more information about the MRC-CERT please contact the Health Department or visit them on-line at www.facebook/manalapanmrc-cert. Manalapan Township -- Law enforcement officers from the Manalapan Township Police Department will be cracking down on distracted drivers during April as part of New Jersey’s UDrive. UText. UPay enforcement campaign.